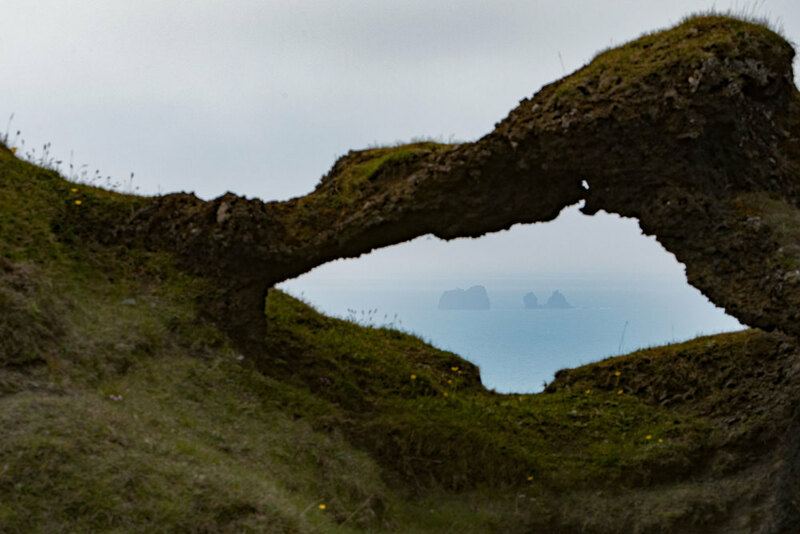 While hiking towards a seabird rookery on Heimaey, the largest island in the Vestmannaeyjar Archipelago, I caught a glimpse of three islands through the “eye of a needle.” The rock formation had been eroded into an arch, and the distant islands stretched to the right of the window. We were exhausted by the steep climb and uneven terrain, so Tamy was more than willing to yield for a photo break. 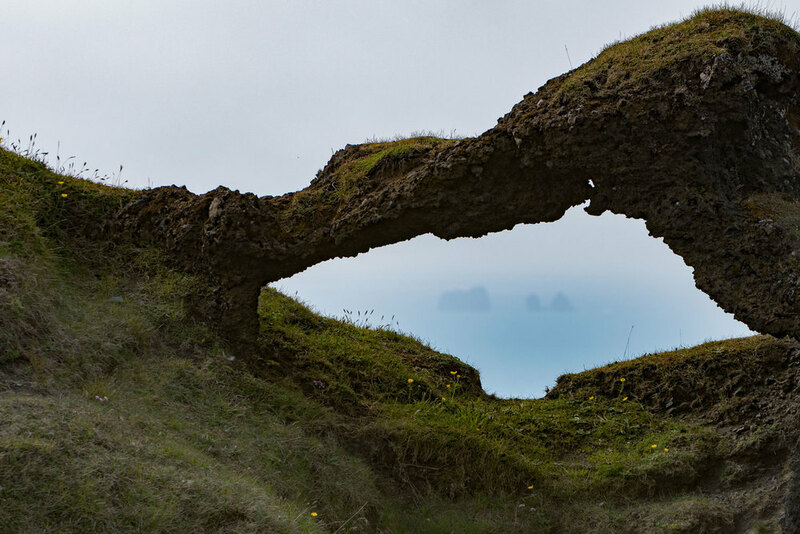 I paced back and fourth to find an angle where the islands would be framed by the arch. Sadly, the light was impossibly hazy and the distance between the foreground rocks and background islands was so great that the photo you see here could not be made from a single shot. To capture what I saw and imagined, the final picture would require some work in post. Aware of this key point from the start, I took a moment to pre-plan the shoot. I set the white balance in the camera to “cloudy” and focused carefully on the foreground rock formation. By setting the lens to 200mm and f11, I knew I would capture good detail in both the plants and arch. After making the first image, I checked the camera’s histogram to ensure that none of the highlights or shadows were clipped. The production of a balanced, yet boring photo, maximized the data for post-processing. Before packing up the camera, I took a second photograph at the same focal length, aperture, shutter speed and white balance, but varied my point of focus. Rather than capturing the details of the arch this time, I focused on the islands in the distance. These two original photographs are pictured below as unprocessed raw images. I nearly deleted the images after uploading them to the computer. However, seeing the pics transported me back to island’s peak and the plan I had imagined during that hike. Rather than trashing the photos, I began to play. I adjusted the clarity, vibrance and sharpness in Lightroom and used the “dehaze” slider to draw out the blues from the water. Experimentation and play is an essential part of the artistic process, yet I rarely allow myself the time and opportunity to “go off road” with my photographs. Once I found the color balance and details hidden in the raw file, I copied the algorithm for picture number one and applied it to picture number two. The product of this “play” can be seen in the following two processed photos. Now that the near and distantly focused images were exposed and processed to my satisfaction, I applied a photoshop stacking routine to combine the two pictures into one. While I do not stack images often, I have relied on this technique when I want to make a photograph with a near-infinite depth of focus. The method I use is derived from James Lewis’s technique as described here. Once the two photographs were stacked into one, I applied a crop, noise reduction and a bit of unsharp mask. The final image, below, is one part imagination and one part reality. It is an interpretation of a fleeting moment seen by tired eyes during an endless hike. Were it not for a moment of forethought where I made the time to imagine a final photograph, this moment would have been nothing more than a memory.